2 FREE Movie Tickets with $20 worth of Schick products! 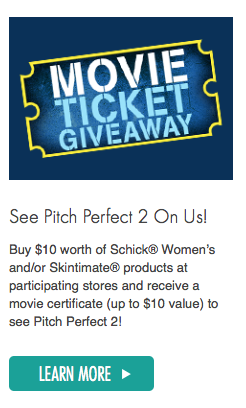 Schick is running a promo, where if you buy $10 worth of WOMEN's Schick or Skintimatic products then you will get a free certificate for a Movie Ticket! Here is a link with all the CURRENT SCHICK PRINTABLE COUPONS out there! For purchases made at Walgreens, Rite-Aid, Kroger, HEB, Wakefern, Meijer, Safeway, Ahold, Albertsons and Giant Eagle. 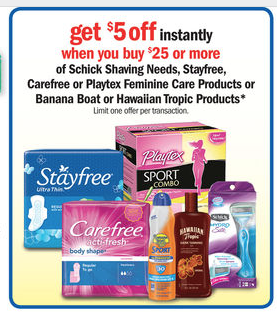 This week at Meijer wyb $25 worth of Schick products you get $5 off instantly!